Even though I haven't written much about it this week, I'm still going strong with the deep water running. I've gone to the rec center just about every day, and I learn a little something new about the water running (a.k.a. "aqua jogging"--I hate using that term! haha). The first time I went, last Thursday, I spent 45 minutes in the pool with the Aqua Jogger belt on, just trying to get comfortable with using it. I focused on my form, and tried to replicate running on ground as much as possible. On Saturday, I went to the pool with Jerry and the kids, and had the intention of aiming for two hours to simulate a long run. We brought the underwater camera, and the first half hour or so was spent trying to get a good video and/or pictures for the blog. 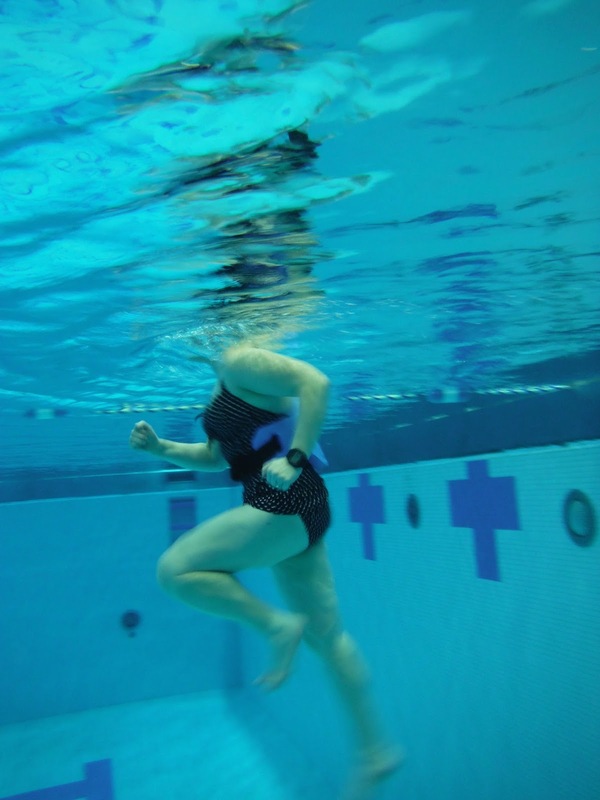 Instead of measuring intervals by distance, like I do normally, I have to do it by time while running in the pool (because running a quarter mile in deep water would take a hundred years. Minimum.) I set my Garmin to do all the counting for me, so I just had to switch speeds whenever I felt my watch vibrate on my wrist. Running hard in the deep water is... well, HARD. It was really tough making it through the 90 second intervals; and then 30 seconds flew by as I recovered. I checked my pulse several times during the workout (my heart rate strap doesn't work in the water, unfortunately), and was surprised how high my heart rate got. The intervals got my HR up to 160-ish. That's 85% of my maximum--what it would be during a tough outdoor run. So my heart rate of 160 would have been equivalent to 172 bpm, which is about 5K race pace for me! After that workout, I realized that you really get out of the deep water running what you put into it. If you run hard, it's going to be a HARD workout; if you just "jog", it's more like an easy neighborhood stroll. This is nice, because that means anyone can do it. 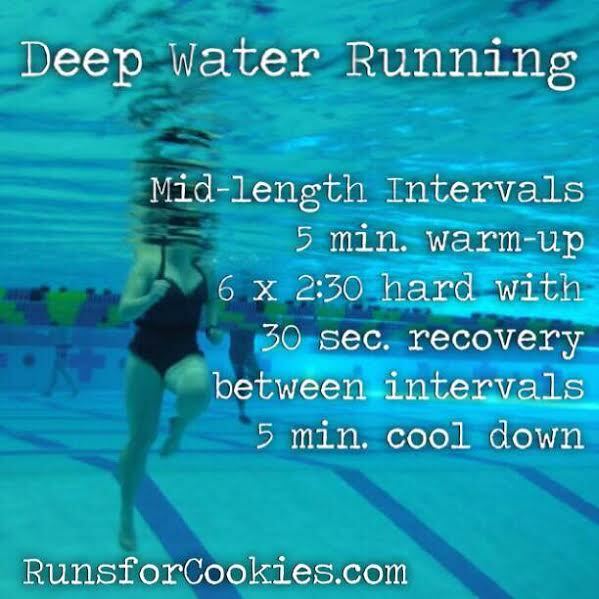 When I got home, I started reading everything I could find about deep water running, and I was thrilled to find a Nine-Week Water Running Schedule from Running Times! I'm going to loosely follow that plan until my ankle is better. The one thing I want to include, however, is a long run--so on Wednesday's steady run, I'm going to go much longer than the time listed. Preferably 90-120 minutes. Yesterday, I went to the pool by myself after the kids were in school, and did the first Tuesday workout. Because the workout was only 28 minutes, I decided to give it my all. Holy hell, that was HARD! Those 2:30 intervals were killer--the muscles in my legs were screaming during each interval. My "recovery" consisted of pretty much just floating there, trying to catch my breath before the next interval. Thirty seconds flies by when you're recovering! My legs were actually shaky as I walked to the locker room. I felt amazing. And I truly believe that I earned every single one of the 5 PointsPlus Weight Watchers gave me for that short workout. That nine-week plan consists of a ton of intervals, so I am going to try and make each workout count by putting in good effort. I injured my left knee running last fall and the doc said the best thing to do would be to hit the pool. Argh, I'm a stone with arms in water! But I got a "Sporti" belt to wear (and then found out the pool already had them) and have been running in deep water every chance I get. Great no impact running, although I have a feeling I look pretty funny doing it. It's been a tremendous boon and the best thing is that my running/cardio level (on the ground) has been maintained. Great job, Katie! Keep it up! I bet it was pretty boring doing the long run in the pool. No change of scenery, nothing to watch on TV, just running in the pool for a set length of time. I remember when I did the stationary bike for a set period of time. I would try to watch a TV show, but even that didn't help speed the time up, and commercials lasted forever! Hope taking Jerry with you will help make the run go faster....cause it sounds like a really good work-out without damaging any of your joints. It's probably something I should look into. But when you mention flabby skin on your legs....mine is just horrendous, along with my upper arms. It's still really hard for me to expose those areas in public. I had lunch yesterday with some ladies I used to work with, and they were talking about going to a gym and doing water aerobics and how wonderful it was. Guess it's something I should look into, and just get over my self-doubt.